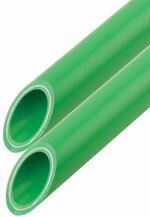 SMX PPR pipes and fittings are made of Polypropylene Random Copolymer (PP-R), also known as Type 3. The quality of our material guarantees long life over 50 years, high resistance to pressure and temperature. This material is suitable for hot and cold water supply systems and heating systems. UV Resistance: PP-R pipes and fittings are not ultra-violet resistant and must be covered, lagged or painted if being installed outdoors. The pipe can be painted using an etch primer to prepare the surface, and then applying a UV stable paint. Head Loss: The internal surfaces of the pipes and fittings are smooth, so limestone or other deposits can not form and therefore head loss is reduced to a minimum. Acoustic: The material elasticity and high insulation capacity mean a considerable reduction in the noise of the installation even when there is water hammering. Abrasion: PP-R pipes allow high velocities of the transported fluid, up to 7m/s, without the problem of erosion, even in the presence of acid and alkaline substances with PH values between 1 and 14. Energy saving: The reduced heat dispersion, in association with a low thermal inertia, allow to supply hot water even if the pipe has not yet reached the average operating temperature. The energy saving is in the range of 10% to 20%. Conductivity: The PP-R system is a poor conductor of electricity; therefore perforation phenomena caused by stray currents are unknown. Since PP-R is a poor conductor of heat, condensation and heat dispersion of the transported fluid are considerably reduced. Flexibility: The flexibility and resilience of the PP-R pipelines allow their use also in seismic areas. The low specific weight means easy transport and handling. The system can be used in traditional site installation, for the preparation of prefabricated constructions and in the creation of modules or fitted walls. Welding: This is a fundamental characteristic of the system. It enables all of the elements in the system to be joined by socket fusion welding or through the use of an electrofusion coupling. This method ensures a completely homogenous system. Frost proof: The typical elasticity of PP-R permits the enlargement of the pipe section under the thrust of the volume increase due to freezing of the conveying liquid. PN 20 - hot water distribution systems, central heating. 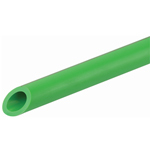 SMX PP-R pipes are made of polypropylene type PP-R. which has excellent hygiene property. Depending on pressure, the pipes can be used in temperature up to 70 C with an extrapolated service life up to 50 years. 4--Recyclable, benefit to the environment. SMX PPR-AL-PE pipes is aluminium plastic composite pipes are consisted of five layers. The middle layer is aluminium foil, connected with inner and outer PP-R layers through thermo welded adhesive. They have better properties than normal PP-R pipes. - service life can last up to 50 years.